Karen Mobley was honored with the inaugural Mobley Arts Impact Award. On the night before Halloween, Spokane's creative community celebrated the Spokane Arts Awards — in costume, of course — at McKinstry Innovation Station. The Leadership award went to Jerry and Patty Dicker, who in addition to owning the Bing Crosby Theater and the Modern Theater, have also heavily invested in a number of other arts-related institutions around town. Ginger Ewing, a co-founder of Terrain and Window Dressing, took home the Inclusion award, while the Collaboration prize went to Saranac Art Projects. The Imagination award was bestowed upon Sharma Shields, author of the critically lauded novel The Sasquatch Hunter's Almanac. 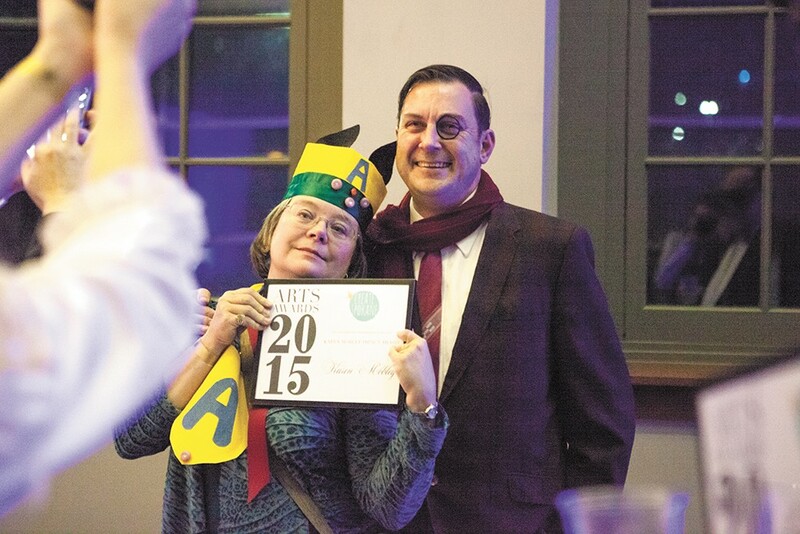 Karen Mobley, pictured above with Spokane City Council President Ben Stuckart, was recognized with the inaugural Mobley Arts Impact Award, which will now be presented to those who, like Mobley, have devoted a lifetime to advocating for the arts. Also announced at the event was Spokane's new poet laureate, Laura Read, whose poems have been widely published in a number of journals. Read is a writing instructor at both Spokane Falls Community College and the Salish Schools of Spokane.